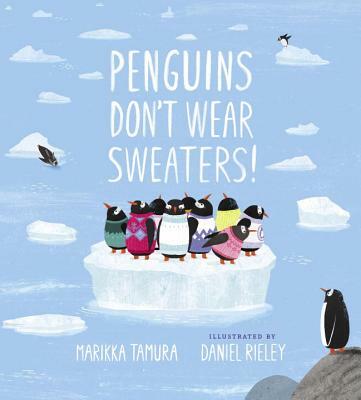 This uplifting, charmingly told story, tells what happens when well-meaning humans knit sweaters for penguins who've encountered an oil spill. You may have seen the cute pictures of penguins wearing sweaters--but did you know why they were wearing them? Debut author Marikka Tamura answers this question in this colorful, kid-friendly book that is told simply and charmingly. Penguins love the sea. Happy in the dark blue water. But what is this? One day something is floating in the water. Dark. Gooey. Oily . . . When the penguins become coated in an oil spill, many Big Boots arrive. The humans want to help the cold, greasy penguins, so they knit sweaters to keep them warm. The Big Boots mean well, but . . . penguins don't wear sweaters! So after a good, soapy scrub, the penguins dive back into the deep blue sea, happily dressed only in their own penguin feathers. Marikka Tamura is a Children's Book Art Director who lives in New York City. Penguins Don't Wear Sweaters! is her debut picture book. Daniel Rieley is a British freelance illustrator. He studied at The Arts Institute Bournemouth, and his illustration projects include picture books, advertising, print, and card design.